Ottavio is a creative multipurpose PSD template with 30 fully layered PSD file fully customizable. Ideal for business, commerce, agency, creative and other websites. Designed on 12 columns Bootstrap grid system. Used google web fonts, fontawesome web icons. 30 fully layered PSD file. 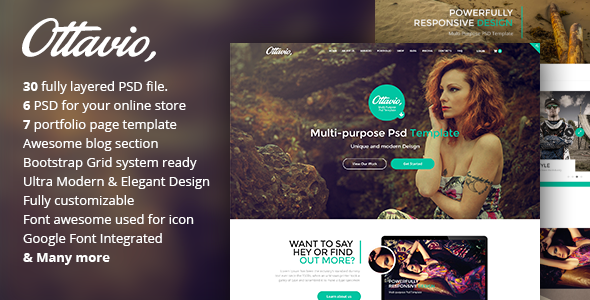 Item Reviewed: Ottavio New Creative Multipurpose PSD Template 9 out of 10 based on 10 ratings. 9 user reviews.